Tastes Like Butter. Works Like Magic. Just four tablespoons per day helps lower your cholesterol in as little as two weeks! Benecol® Original is perfect for cooking and baking. Swap out oil or butter with equal parts Benecol® for your favorite recipes! 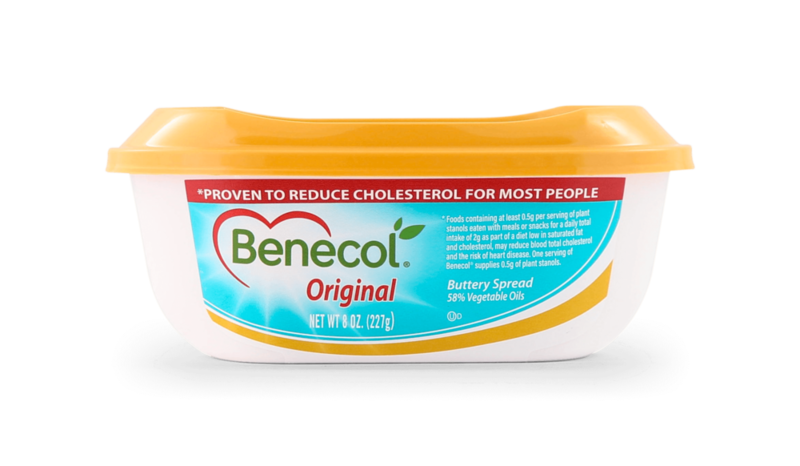 Our Benecol® Light balances a great buttery taste and the same cholesterol-lowering benefits, but with fewer calories. Try it melted onto veggies or whole grain pasta, or lathered onto a piece of warm toast! A healthy cholesterol-lowering diet including plant stanols reduces cholesterol more effectively than a healthy diet alone. The effectiveness of plant stanols in reducing cholesterol has been proven in over 70 clinical studies, including including reports published in The New England Journal of Medicine and The American Journal of Cardiology. For more research supporting plant stanols, click here. Benecol Buttery Spreads with Plant Stanols from BenecolUSA on Vimeo. The plant stanols in BENECOL® lower cholesterol more effectively than a healthy diet alone. It's been proven in over 70 independent scientific studies, including one published in The New England Journal of Medicine. More research proving effectiveness of plant stanols here.